It has been an exciting year for Medford resident Kerri McBride, who was named the Burlington County Farm Fair Queen this past July. Setting herself up for an equally as exciting new year, the 17-year old has now earned the title of the 14th New Jersey Agricultural Fair Ambassador for 2017. 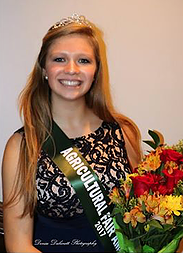 After becoming the Burlington County Farm Fair Queen, McBride was given the opportunity to compete in the New Jersey Agricultural Fairs Ambassador competition that was held in early November. To compete, she was instructed to write an essay on what agriculture meant to her. To be selected, she also had to interview in front of a panel of three judges and present a speech on how she intended to represent the state’s agricultural fairs if she were to be chosen as the ambassador. After she completed each criteria, the judges deliberated between McBride and nine other contestants, ultimately selecting her as the winner. “To be honest, I was extremely surprised that I had won, but I think the judges realized that I represent a large portion of people who don’t necessarily live on a farm but are passionate about agriculture and science,” McBride, a homeschooled senior, said. McBride believes she was selected as the winner based on her heavy involvement in science, as well as for the few research projects related to sustainability and agriculture she has conducted. Through Delaware Valley Science Fair, she was selected to present her research at the U.S. Department of Agriculture’s research center. Additionally, McBride has volunteered in an environmental engineering lab at Drexel University for a summer where she was able to work with a graduate student doing research involving agriculture. In her spare time, McBride is actively involved in the 4H Clogger’s Club, is the president of the Burlington County 4-H Player’s club, the director of community service for the NICHE Mock Trial team, the 4-H food and fitness ambassador, the Conserve School Alumni and admissions ambassador and is part of the Sovereign Grace Church youth group. She also enjoys exercising, volunteering, camping and conducting independent research projects. Although there are no further agricultural fair ambassador competitions past the state-level, McBride intends to use her time as the winner of this competition to the fullest, attending all 20 agricultural fairs in the state and the agricultural convention held each year in Atlantic City. She will also be given the opportunity to discuss and promote the many elements involved in supporting the state’s agriculture industry. Her year-long term as New Jersey Agricultural Fair Ambassador will end in November 2017, when she will be given the opportunity to crown the next fair ambassador. For more information on New Jersey’s agricultural fairs, go to the website njagfairs.com.